Who cares? Well they are still important, if you send an internal email (to someone in the same Exchange Organisation). Exchange uses this address NOT the SMTP address which you would expect. Also Microsoft Outlook has a habit of caching this address and NOT the SMTP address. Normally this is not a problem, UNTILL you migrate your mail somewhere else, then the internal cached ExchangeLegacyDN addresses are now incorrect. (See error message below). How Does Migrating To Office 365 Handle This? If you do a Hybrid Exchange Migration with Azure AD sync, this is all ‘fixed’ in the background for you, When you first get your AD user ‘synced’ (i.e before you migrate the mailbox) you get an X500 address that’s just used in O365. 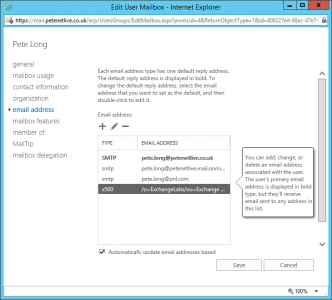 Then once the mailbox is migrated the users gets the ExchangeLegacyDN copied across as an additional X500 Address. You will see problems ‘Post Migration‘ to another domain, to a newer version of Exchange, or if you use a third party tool, to migrate your users to Office 365, (which is just another domain to be honest). 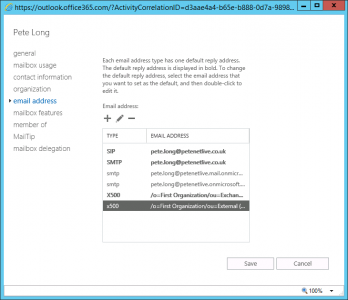 For more information, see Fix email delivery issues for error code 5.1.11 in Office 365. You can either tell your users to run (within Outlook) File > Options > Mail > Send Messages > Empty Auto-Complete List. Or try fighting with your users NK2 Files, (if you are on older versions of Outlook).